An interactive introduction to learning the alphabet for young children, with help from their favourite Farmyard Tales characters including Mrs Boot the farmer, her children Poppy and Sam, and Rusty the Dog. Each farmyard picture encourages children to spot familiar items and complete the scene with the correct stickers – from apple to zoo and everything in between. 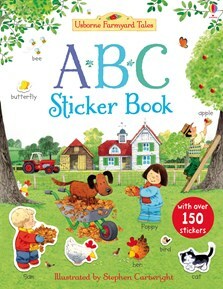 Children will love poring over the busy pictures and choosing from over 150 stickers whilst learning letter recognition, letter sounds and alphabetical order.